Scientists refer to running economy (RE) as the steady-state submaximal metabolic energy expenditure (VO2submax). It’s a fancy way of saying how much energy you spend when running at a speed slower than your maximum. One could picture RE as the human body’s equivalent to fuel consumption in a car. For instance, if a Ferrari and a Ford Fiesta were sent out to drive a distance of 100 km at a speed of 100 km/h, the Ferrari would consume about three times as much gas as the Fiesta. Thus, the Fiesta uses much less energy to cover the same distance and is therefore more economic. In long distance running, this is usually what singles out the winner of a race. Even though other factors such as maximal oxygen uptake (VO2max) play a part, RE is considered the best predictor for long distance running performance (distances of 3000 m and above). Among elite long distance runners having small differences in VO2max, it has been shown that a significant correlation exists between RE and performance at a 10 km race . Runners with lower (better) RE also had the best race times. So if RE drives running performance, what is it that drives RE? Factors such as muscle fiber composition, capillary density, body shape and training status all affect running economy but the dominating (> 50 %) contribution to RE has been found to be related to biomechanics . In other words, your RE will at large be determined by the mechanical efficiency of your running motion. 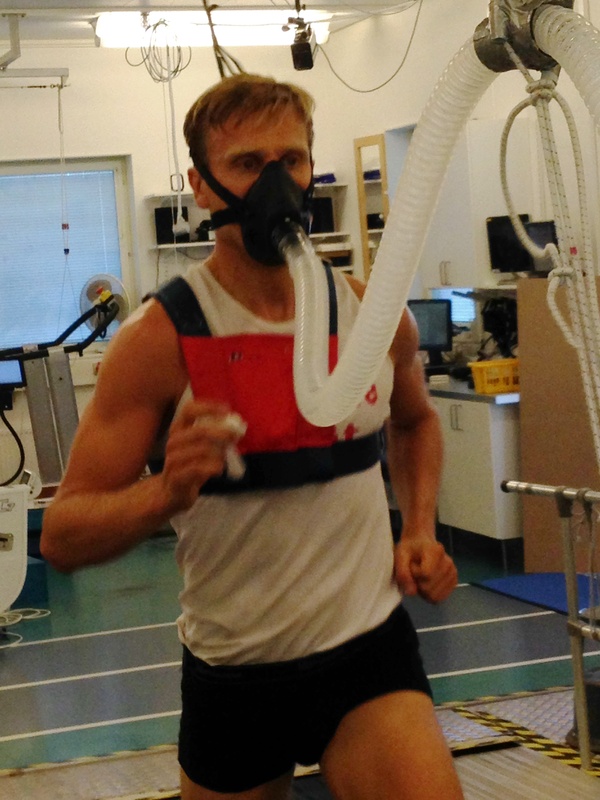 The conventional way of determining RE is by measuring the submaximal oxygen consumption, VO2 submax. A VO2 submax measurement reflects all metabolic processes in the body that require oxygen and depends on both physilogical and mechanical factors. During running, most of the metabolic energy is used for the muscles to produce the work needed to maintain forward motion. Does this mean that runners with the lowest VO2submax always have the most efficient running mechanics? Not necessarily so. Instead, they can simply have a better fitness level, a larger proportion of slow-twich vs. fast-twitch muscle fibers, a better thermoregulation or perhaps spend less work in the breathing process. In fact, it has been shown that the work of breathing alone constitutes up to 7 % of the total oxygen consumption during exercise . How can one then determine who has the most efficient running mechanics between two runners with vastly different fitness levels or other physiological attributes? Surely, at least for a shorter period of time, an unfit runner should be able to perform a mechanical running motion that is at least equally efficient as that of a fit runner. In a VO2submax measurement, however, this would be very hard to conclude due to the strong physiological influence on the total RE. In order to exclusively assess the impact of running mechanics on RE, the mechanical contribution should be separated out of the of the total RE. This is precisely what MotionMetrix does. MotionMetrix’s RE is of strictly mechanical nature, eliminating all other contributions from the equation. Obvioulsy, this opens up unique possibilites to study how running techniqe couples to energy expenditure. With MotionMetrix, it is perfectly possible for a untrained runner to outperform an elite runner by executing a more efficient movement pattern. Still, there is a close link between MotionMetrix’s mechanical RE and the total RE obtained from VO2submax, especially in response to changes in mechanical energy due to e.g. speed changes. So will an improved mechanical RE with MotionMetrix also yield faster race times? Given some time for the muscles to adapt for the new motion pattern, the answer is most probably yes. Initially, however, a change to a mechanically more efficient running technique may not yield an improved total metabolic RE as measured by VO2submax beacuse the muscular adaptation is lagging behind. Let’s take an example. A runner is running at her marathon performance pace of 12 km/h which corresponds to 80 % of her VO2max. The runner makes a correction to her running stride by a slight increase in stride frequency yielding a subsequent reduction in vertical oscillation. MotionMetrix indicates a 4 % improvement in mechanical RE going from 3.1 Joules/kg/m to 2.95 Joules/kg/m. With some adaptation time, this results also in an improved total RE by 4 % in the total RE as measured by VO2submax. Now she is able to run at the same speed at only 76 % of her VO2max. Alternatively, the 4 % improvement in RE allows her to increase the speed from 12 km/h to 12.63 km/h while maintaining the initial effort level of 80 % of VO2max. In a Marathon, this would shorthen her race time by 10 minutes. Assuming her personal best at a 10 km race was 41 min 45 s at 90 % of VO2max, a similar improvement of her RE by 4 % would allow her to finish a 10 km race below 40 minutes. Even though some biomechanical stride parameters have shown to be more important than others for RE, it is the mechanical efficiency of the whole motion pattern that ultimately determines the impact on RE. It is also the case that a change in one parameter will inevitabely affect many others and therfore also change the overall motion pattern. As an example, an increase in stride frequency may reduce the vertical displacement and shorten the ground contact time but also increase the velocity of the body segments. If the change in stride frequency yielded a better RE, one could not ascribe the improvement to the increased frequency alone since other parameters were affected as well. 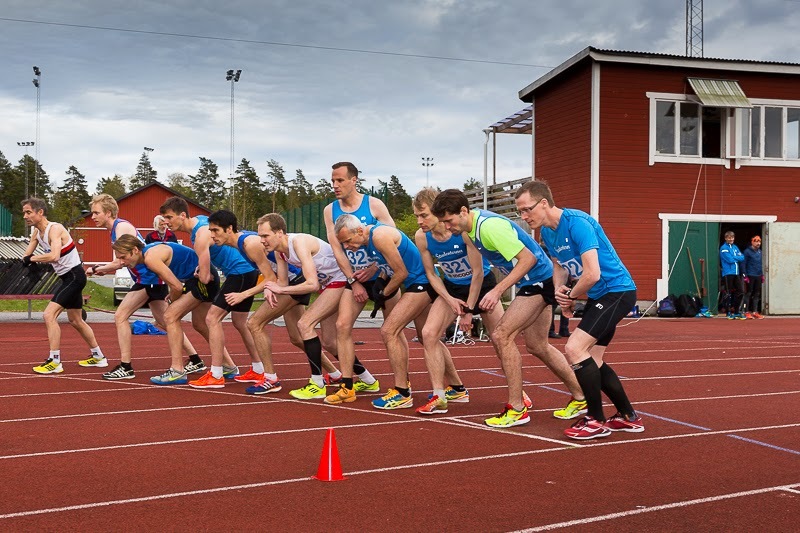 Nevertheless, if a runner has a stride frequency that significantly differs from the norm, where the norm is set by the average elite distance runner for instance, it would be a given starting point in the journey towards improved RE. Below is a list of parameters that have been identified as important for RE in the scientific literature. All of these parameters (and many more) are measured by MotionMetrix. An important key to economic running is the use of elastic recoil, i.e. the process of storing and releasing energy from the elastic elements in the leg such as the Achilles tendon during ground contact. The efficiency of this process is largely controlled by the ground contact time [4, 5]. The shorter the ground contact time, the larger the elastic recoil and the better the RE. However, to reach optimal stretch of the tendons, a large enough vertical force needs to be produced during the ground contact. As an example, runners who run with high stride frequencies and low vertical displacements might indeed produce short contact times but the vertial force will most likely to be insufficient for large elastic recoil to occur. Elastic recoil is accounted for in MotionMetrix’s RE.